Celtic youngster Kieran Tierney has been named in a select XI of the most promising youngsters in European football compiled by Spanish newspaper Marca. The 18-year-old has been in terrific form for Celtic this season, usurping Emilio Izaguirre as the first choice left-back despite his inexperience. Manager Ronny Deila has called for him to already be considered for Scotland squad selection, and it appears his growing reputation has extended on to the continent. 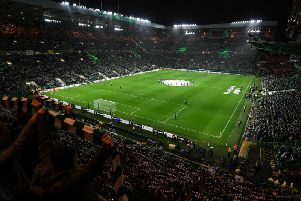 Marca included Tierney in the side along with rumoured Celtic target Martin Odegaard, Milan’s 16-year-old stopper Gianluigi Donnarumma and Porto captain Ruben Neves, among others. Tierney signed a four-year contract back in August, so Celtic fans should be able to appreciate his talents for a good while yet.